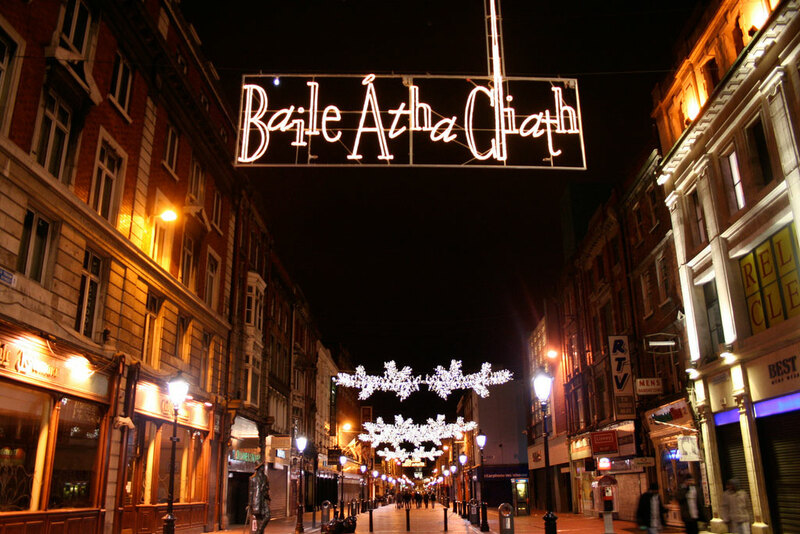 Winter in Ireland can be cold… but not so cold that you can’t go out and enjoy all the Christmas festivities that Dublin has to offer! Luckily for you, we’ve rounded up a list of the top ten activities to do during Christmas time in Dublin, so bundle up, and get out of the house, you’ll be singing Christmas carols in no time. Is there a better way to get festive than by taking in a few classics down at the Temple Bar Square? This outdoor living room can provide fun for the whole family, or a romantic date night, giving you a chance to snuggle up to your beloved! They show all the Christmas and winter classics; Home Alone, Elf, Frozen and many more! Don’t worry about the weather, as there is a retractable roof and complimentary blankets, to keep you warm and dry. Admission is free and the viewings will begin the first week in December. What better way is there to see Santa than by taking a train through a magical forest to his workshop? Head a bit south of Dublin to Wicklow to hope on the forest train. After arriving to the top-secret location deep in the forest, you’ll find that there are plenty of songs, toys and stories to entertain the whole family, along with some Instagram worthy moments! After exploring the workshop, head over to the Christmas Barn to enjoy some beverages whilst enjoying the carnival-like atmosphere. Over did it on your Christmas shopping and a little short on cash? No problem! After enjoying a few pints at your local, head over to Grafton Street to enjoy the street performers on Christmas Eve! There have been several occasions where top musicians come for a session, so sit back, relax and enjoy the show! Ireland’s largest theme park has an array of Christmas related activities on every winter, so head on over over! The Christmas market has all the smells and tastes of Christmas, and gives you a chance to look for stocking stuffers and handmade crafts! Or, give your inner athlete a chance to shine on the new skating rink. Either way, you’re sure to have a fun time! Enjoy a candlelit Christmas carol concert at the National Concert Hall. Even if you’re not a music lover, this elegant night will be sure to take your breath away. From the fancy venue, to the candlelight glistening off your loved ones faces, the night will give you a chance to reflect on all that you’re thankful for this Christmas season. Book your tickets as soon as possible, this event is sure to sell out! Looking for a way to work off a few of the cookies you indulged in? Look no further than a festive swim at the Forty Foot at Sandycove. Even if you’re not daring enough to jump in, it is still a sight to be seen, as many take in the tradition of jumping in the freezing water, if not just for a minute! Don’t forget your favorite festive bathers! It’s isn’t just Christmas season… it’s also Pantomime season! Take in a pantomime with your family or friends for a good night out. The Gaiety, The Helix and The Olympia always have good ones worth checking out! Get spiffed up and head to one of the nicest bars in Dublin- the Shelbourne Bar, for a few cocktails in the amazing setting decorated for Christmas. With a massive, magnificent tree, Christmas themed cocktails, and a full, snowy train set, it’s a great place to spend a few hours to relax before the madness of Christmas sets in. This classic Christmas experience has been around for more than 60 years, but recently updated to be better than ever! Much bigger than before, this historical attraction is running upon donations (suggest donation is €50) and perfectly captures the joy of the season! It isn’t just the crib, there are now competitions, dress up “selfies”, a story corner and much more! Christmas is all about spending time with those you love, friends and family alike! The perfect way to celebrate those in your life is to head over to your favorite pub and enjoy a pint (or bottle of your favorite spirit) with those who are special in your life! You’ll be fighting for a bar stool (and maybe a hangover Christmas morning), but it will be worth it! New to Dublin? Head over to The Long Stone between D’Olier St and Tara St where you can grab cheap beer in a great atmosphere. (Not to mention super close to public transport when it’s finally time to head home) Don’t forget your Christmas bags under your stool!